Event has passed but watch for next years! For over a decade, the Bend chapter of OHA has put on a youth upland bird hunt. 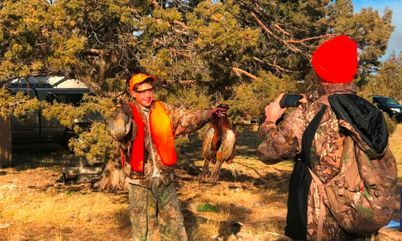 This is a great opportunity for young hunters to gain experience, knowledge and skills for upland hunting in a local, affordable, and responsible way. If you have a young hunter or know one, please sign them up and come join us. We have space for up to 42 youth but since space is limited preregistration is required. Contact the Bend ODFW office to sign up and get your information package. There is a $10 registration fee. It doesn't matter if your young hunter is a great shooter and hunter or if this is their first time in the field. It doesn't matter if your youth is male or female. It doesn't matter if you or they are an OHA member. 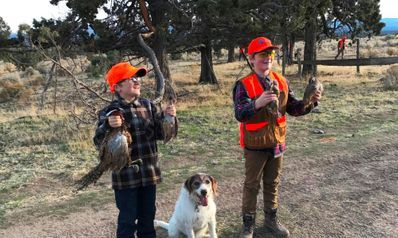 If they have a gun, a dozen shells, a Hunting License with Upland Game Bird validation and a Hunter Education Card then they are eligible and welcome. To see more pictures from this event go to the Photo Gallery!